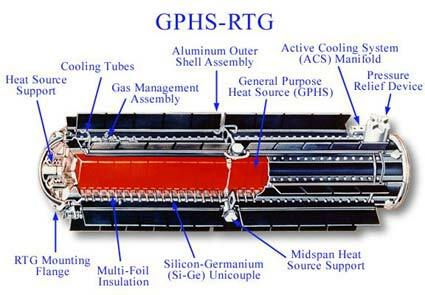 A radioisotope thermoelectric generator (RTG) is a power source often used for deep space missions because of its long life, steady output, and independence of solar illumination. RTGs employ banks of thermoelectric elements (typically silicon-germanium unicouples) to convert the heat generated by the decay of a radioisotope, such as plutonium-238 (half-life of 87.7 years), into electricity. They are relatively expensive and heavy, and, because they produce nuclear and thermal radiation that can interfere with electronics and science instruments, are generally mounted some distance away from other equipment. On the positive side they are reliable, durable, and produce plenty of power. Each RTG used on recent NASA planetary spacecraft contains approximately 10.9 kilograms of plutonium dioxide fuel. Galileo was equipped with two RTGs and Cassini with three. RTGs have also been used to power Pioneer 10 and 11, Voyager, Viking, the Apollo surface experiments, and, more recently, Ulysses.